Some high school band moms might hang up the fundraising baton when their kids graduate, but one group of Carrollton mothers is marching on. JIM MAHONEY/DMN Airborne Angel Cadets of Texas members (from left) Tammy Duplechin, Nancy Carter and Paula Hollis met this week to try to meet the mailing deadline of Monday for parcel post packages to troops overseas. And this time it's for another set of marchers. The Airborne Angel Cadets of Texas meets monthly to send care packages to U.S. troops in Iraq and Afghanistan. And as the holidays approach and mailing deadlines loom, the group of former band boosters is working double time to serve those who serve their country. "It's hard to imagine that someone who could easily be one of our children is over there," said Lewisville resident, mother and group member Paula Hollis. "For a lot of these kids, their families can't afford to send them goodie packages." The Airborne Angel Cadets started out as Carrollton's Newman Smith High School band booster club, but the group's mothers needed another excuse to get together when their kids graduated. They started gathering to send care packages to their children at college, but early last year the kids said they'd had enough of the brown boxes filled with socks and cookies. The moms needed a new purpose, and that's how the nonprofit Airborne Angel Cadets was born. "It started off as a band-mom thing, but we started collecting friends and family and now it's growing and growing," said Carrollton resident Nancy Carter, one of the group's founders. The group has adopted five military units since it started, and members communicate by e-mail with the overseas service members to find out what they need. And the troops need it all, Ms. Carter said. The moms have sent hundreds of boxes filled with sunscreen, video games, chips and salsa, towel hooks, underwear, foot baths, jalapenos, silly hats, water guns and basketball shoes to the Middle East. Capt. Maria Kimble, an Army social worker, said the signed cards and handwritten letters of support the moms include in the packages are as appreciated as the goodies. The moms adopted an armored cavalry regiment Capt. Kimble was working with in Tal Afar, Iraq, last year. "I would post them [the cards and letters] on my outside office wall so all soldiers could see that their sacrifices where being appreciated back home," Capt. Kimble wrote in an e-mail. 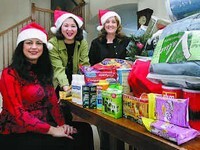 The moms buy the gifts or ask local businesses to donate them. They pay for most of the postage costs – that's $300 to $400 each month. "So if anyone wants to help us out, that's where we need it – in the postage," said Ms. Carter, who is a flight attendant. They've also paired up with other local civic groups that want to send packages to the troops but don't know how, and that's where they see their potential. "Someone who can only do this once or twice and doesn't want to adopt a troop, they can go through us," said Ms. Hollis. The e-mails they've received show they're making a big impact already. "I feel like Santa distributing the packages," 1st Lt. Mike Steele, now stationed in Iraq with his Army unit, wrote in an e-mail sent this week. "Thank you so much. The packages are really appreciated. There is nothing like spending a tough day outside the wire and coming back to packages from home. It's a real morale-booster."